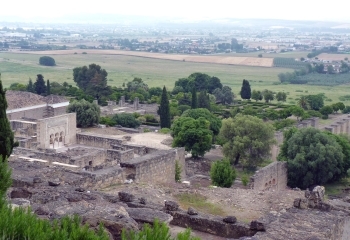 The Caliphate City of Medina Azahara represents the urban planning of the 10th century Umayyad caliphate in the Islamic West. 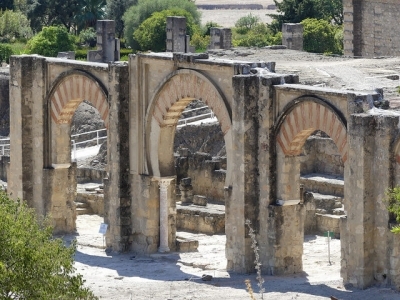 Medina Azahara is a ruined city, that lay undiscovered until the beginning of the 20th century. 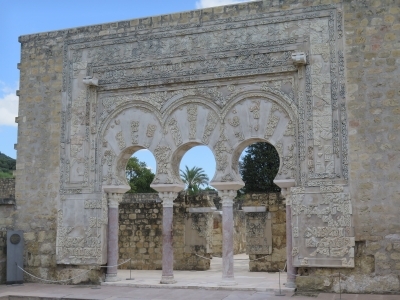 It was a palace-city built by Abd-ar-Rahman III (912–961), the first Umayyad Caliph of Córdoba, as the symbol of his power. 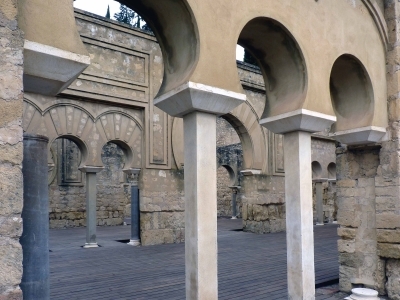 It served as the de facto capital of Al-Andalus. The city included ceremonial reception halls, mosques, administrative and government offices, gardens, a mint, workshops, barracks, residences and baths. 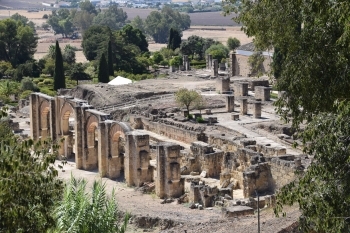 On a trip to Córdoba and Granada a few years ago, I visited the ruins of Medina Azahara (Madinat al-Zahra), about 8 km to the west of Córdoba (there are trips organized by the tourist office). The Caliph of Córdoba had this palace town built in the 10th century, but it only lasted a few decades. Only a fraction is excavated, but it is a fascinating archaeological site to visit and walk around in, and there is a very interesting museum. It could have been inscribed as an extension of the Córdoba WHS, but considering its great archaeological potential, it’s just as well that it is a separate site. When I was there, there was talk of a problem with a kind of shantytown nearby that authorities thought would dissuade UNESCO from inscribing the site (although I didn't see any and there was certainly none in the immediate vicinity). I visited this tentative WHS (aiming for inscription shortly) as a side trip from Cordoba in September 2017. The view from above (just before the entrance) was the highlight of my visit together with the museum. The closer you get to what is left the more you notice the reconstruction work and the OUV (if any) of the what remains gradually subsides. The site's importance in Islamic architecture and its OUV in terms of what it once was would make it a worthy extension to the WHS of Cordoba but in my opinion it does not deserve to be inscribed on its own. We visited this “about-to-be-inscribed” T List site in May 2018 and arrived at much the same conclusions about it as Zoe has since reported. Having viewed several recent TV programs which had included it, we had great hopes, but in the end it disappointed - the "on show" reality doesn't live up to the "vision" (partly because of the way it was presented) even if you try hard to add your own imagination. The Museum, however, is excellent, both architecturally and in terms of its contents - we probably gave it as much time as the site. Entrance to the museum and site is, in theory, free only to EU citizens (but only Eur 1.50 otherwise). We were asked our nationality and this was recorded by the desk clerk. The entrance hall contains a number of (open and unused) guichets as if there was/is an intention at some time to charge more general entry fees. We asked if the impending inscription might mean that charges for all would be introduced and were told that the management hadn’t decided yet. The bus costs Eur 2.50 return with a reduction to 1.50 for “jubilados”. The road up to the site IS public and turns off to a restaurant and the monastery of San Geronimo a short way before the small site car park which is blocked by an electronic barrier which only staff and buses can open. The naming of the site as it is to be inscribed has been somewhat "problematic". The T List title created in 2015 was simply “Madinat al-Zahra” - and that is what appears on the entrance sign at the museum and throughout all the other on-site documentation. For some reason however, Spain nominated it as “The Caliphate City of Medina Azahara” (reverting to the earlier T List name from 1998). Indeed our local B+B owner mentioned “they have changed the name” when we discussed the upcoming inscription. But this doesn’t seem to have entirely pleased ICOMOS who, in Dec 2017, asked for “further information regarding the name of the property”. It has ultimately recommended that “the name of the property be modified in order to keep the historical name to become “The Caliphate City of Madīnat al-Zahrā’”. Quite what subtle overt or subliminal messages are being sent/implied by these alternative names isn’t clear to me! Presumably arguments over "authenticity" play some part? Whether it was because of long term restoration work or because the site was being “tarted up” ready for inscription I don’t know but, during our visit, the “Rich Hall” of Abd al-Rahman III was blocked off to visitors by ropes across the path - as were the gardens beyond it. This hall, which has been reconstructed and roofed, contains decorated pillars and arches in alternate red/marble similar to those in the Cordoba Mezquita - but only one arch high. This, unfortunately, is a highlight of Madinat al-Zahra and not being able to see it was a bit of a "downer". The rest of the site is much less “spectacular”. It has vast areas (almost 90% of the site apparently) which are un-excavated. So we could only look down upon the partially excavated Grand Mosque but could see enough to make out that it is the only building not to follow the strict orthogonal layout of the palace area – presumably in order to correctly face Mecca. Much of what was the "Medina" (as opposed to the "Palace") lies completely un-excavated beyond - it will be interesting to see where the boundaries of the site are placed. Encroaching developments in the villages onto to what might seem to be "fields" have been a concern and explain both why the visitor centre is so far away and why it has been given such a "low" profile physically. From the Palace area, the city of Cordoba (both its old buildings and its "out of town" developments) can be made out in the distance across still reasonable, albeit reducing, "countryside". The site's location in relation to Cordoba. in terms of both distance and height. was important to the Caliphs. Within the main “tourist route” through the palace area there are a lot of blank, partially reconstructed, walls around 1 - 2 metres high with floors of rough pebbles and notices stating things like “these were the servants quarters” - well they could have been anything! There are also a number of reconstructed decorated arches such as those of the “Grand Portico” but many of them have been reconstructed using largely “unauthentic” material plus just a few original pieces (photo). And, as Zoe says - having gone to all the trouble of producing a CGI video which animates the visit of a Christian King to the Caliph (possibly based on that by the Christian king of Leon - Ordono IV in 962) and traces the route taken by his entourage, the areas where they had to wait etc etc, one might have hoped that the tourist path would have more clearly have related its route to that video. This place used to be an ancient city in the styles one can see at the Alcazar in Sevilla but rather than "just" a palace or building the area was an entire town with garden built strategically into the slope of the mountain. Having said that the ruins don't seem as massive as it sounded like beforehand and the big importance of the site as seen in the video is not very evident. To reach the site you need to get to the outskirts of Cordoba. The museum is at the parking lot and free for EU citizens (there was no ID check so maybe they go by accent or trust? I.e. hide your American accent and seem trustwurthy, or just fork out whatever they ask for.) Inside you watch a prerendered CGI movie about the history of the city and it's daily ongoings. It prepares you for what you are about to see up the hill, kind of. There is a regular bus that takes you to the museum but it is not free. I guess you could walk up the hill for free but you definitely cannot drive up there in your own car. I find that a little odd because they could easily fit a parking space nearby or at least closer than where it is now. The site itself is poorly signed. The directions of the paths are even misleading. I love the standing arches and took a lot of pictures here but the connections to what the walls used to contain is unfortunately lost without a guide. The video showed you a lot of places and trying to find them is not easy. So whereas I found the site surely had lots of value it clearly lacks in presentation and some better explanations down in the pits would be appreciated. We could see no city, but building-structures and arcs that still are standing upright tells some of the story of what it has been. The site is the capital of the caliphate Abd al-Rahman III founded in 940, abandoned in 1010, then slowly buried in a meadow. By the years it turned into a myth of a faraway western point of Islam, then revealed in 1911. We got the overview, but missed the archeological details. When it becomes a true world heritage site we have to revisit this place. Liquid Mercury: The 11th C Andalusian poet and Jewish philosopher, Solomon ibn Gabirol, described how, at Madinat, "a pool full of quicksilver ..... was placed in a palatine room surrounded on each side by eight doors with ivory and ebony arches encrusted with gold and pearls and supported by colored columns with diaphanous glass. When al-Nasir wished to impress a visitor, he made a sign to one of his slaves to shake the mercury and the flashes that irradiated on the hall façade (‘maylis’), and inside, produced such displays of light that the audience was captivated and even had the impression that the building was taking flight together with those present as the quicksilver moved."